Winslow Homer - Baaad Example! There is no doubt in my mind at all about who my favorite watercolor artist is: Winslow Homer. 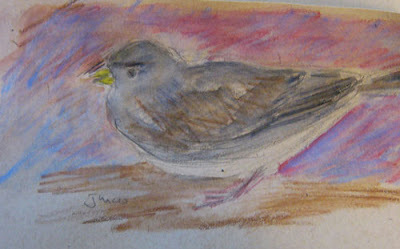 I couldn't say this about drawing or painting but I can about watercolor. So I was very happy to get a new Homer book for Christmas: 'Watercolors By Winslow Homer: The Color of Light' from my old haunt of the 1960s and early 1970s, the Art Institute of Chicago. While working my way through it today as I stared at some tentatively finished paintings in my studio I came across examples of his scraping and blotting to alter previously applied pigment. This is something I can use I thought. 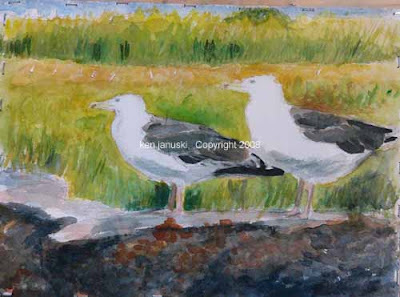 A while later I decided to remove the staples that attached my 'Greater Blackbacked Gulls' watercolor from its stretcher board. But after I had taken off a couple of staples I remembered what I'd said in an earlier post about the painting: it was really lacking in tonal variety. I'd also just read about how important tonal clarity was to Homer. As I looked at the painting I thought: What a dud! So I went back to work on it, using scraping, blotting, erasing into wet paper, and variations on these to try to bring more tonal variety and clarity to the painting. I think that the new version is an improvement. When I labeled this post 'Winslow Homer - Baaad Example' I of course wasn't criticizing Homer. My point is that the good example of quality art can persuade you to alter your own work, perhaps destroying it in the process. But that's really my artistic background. You work and work and work at a painting until it seems finished. For some artists this will be primarily a 'visual' finish. For others some other category/value is applied to determine finish. There have been many times where I've ruined a work by going back into it, sometimes with an idea that was brighter in my mind than when put into practice. But generally speaking you become a better artist by setting higher standards for yourself and not always settling for your first attempt at something. But watercolor, particularly if you're new to it like I am, presents a dilemma. It's so easy to ruin the freshness of a watercolor by overwork. On the other hand Homer is a great example of ambition in watercolor. He shows you that you can go back into a watercolor and try to improve it, knowing that you may in fact ruin it, but also showing many great examples of exactly the opposite result. What a great example he sets for all watercolor artists! I sent out a number of holiday greeting cards based on a photo I'd taken of one of my sketches, and we got normal greeting cards, and online greeting cards and of course phone greetings. But my wife Jerene shows how to do holiday communication the old-fashioned way: with a nose-pat. We like to take a short walk at the Wissahickon on all the major holidays. Yesterday we were greeted by a Brown Creeper, what seemed to be a dueling Red-Bellied Woodpecker and a Yellow-bellied Sapsucker, and a very visible Red-tailed Hawk. But when we finished our walk we were greeted by these two horses. Jerene couldn't resist saying hello to them. And I couldn't resist taking a photo. That photo served as the jumping off point for my newest watercolor pencil and waterbrush endeavor, this time using my new set of 36 Derwent watercolor pencils. It's a little too early to say much about them but they were good enough to get me started on this sketch. My thought is that I'll soon be very fond of them. Today I finally broke down and put up my spotting scope in our tiny kitchen. Once the tripod legs are spread out there's barely room for anyone, human, feline or possibly even avian, to move. But sometimes you just need to see your subject better. 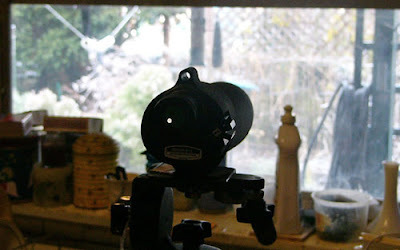 In this case the Mourning Dove, Downy Woodpecker and Junco were viewed through the scope. The detail that you can see when viewing through a scope always has the potential to make a better drawing. Though I don't show it here, or only with the vaguest suggestion, I could really see the complex and beautiful pattern of the dove. Also the wind-created lines in its breast feathers. That knowledge may not show up in the drawing done the same day. But it does add to my storehouse of knowledge, not to mention my visual appreciation, of the birds I see. It's a pain to peer in the scope then refocus on the drawing pad remembering what you've just seen. But contemporary artists are lucky that we even have scopes. We should probably just count our blessings and not complain. 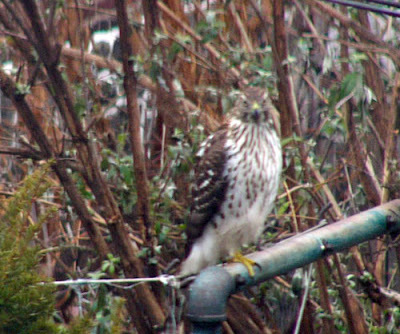 This last photo is of an immature accipiter that's been in the yard recently. We've had a number of immature accipiters, as well as mature Cooper's and Sharpshinned Hawks this fall. I've not been able to do much in the way of sketching them live. But I do hope to do a more developed drawing or painting from photos soon. You might call this a perfect setup: a scope to see detail, convenient drawing and painting utensils, and cooperative birds! I should say right off that there's a lot of hyperbole in the title of this post. If it's too much just enjoy the sketch and move on. 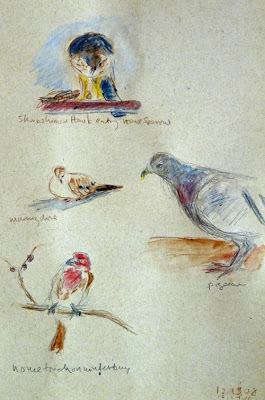 I suppose you could say it's a crime that the Sharp-shinned Hawk in the upper left of this sketch caught a House Sparrow and calmly tore it apart for a morning meal. Many hawk-lovers would disagree and say that hawks have as much right to eat as any one else. I won't get involved in that argument except to say that the people who say this generally tend to seem to protest a bit too much about how natural the carnage is. But the crime I'm talking about is of a different sort: that of viewing birds anthropomorphically, or from a human perspective. I'm sure that this tendency has tended sometimes to making birds far cuter than they really are, and forcing upon them our human attributes that may be far from the attributes that a more objective observer might see. For instance seeing a mama Phoebe feeding a young bird that is almost as large or maybe even larger than her is both heartwarming (nurturing the young) and comical (the babe is bigger than the mama). Of course more knowledgeable birders realize the tragedy: she is feeding a baby cowbird, whose own parent has parasitized her nest by laying its own eggs there. She might in fact raise only cowbirds and none of her own children, not recognizing the foreign intruders for what they are. The decline of many songbirds can be attributed in part to this cowbird behavior. So humans can be wrong in their interpretation of bird behavior and other animal behavior. Some people are so against this they almost consider it a crime. We should never attribute human motives to what seems to be analogous behavior in other species. But what else do we have? We are human. It's hard to see things in a different light or from a different perspective. Which brings me in a very roundabout way to the title of this post and to this drawing. I've been writing a lot a here and at 100swallow's great blog The Best Artists about art that is based on a thorough mental memory of the subject. At 100swallow's site the subject has been the horse as drawn by Michelangelo and Leonardo. Here the subject has been birds. 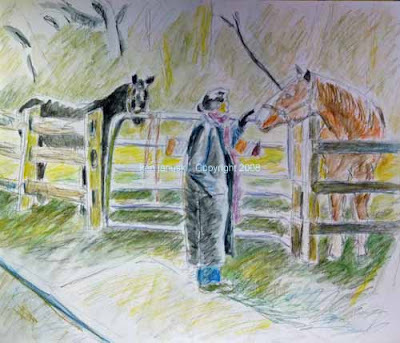 But both have talked about the need to actually observe animals in nature and draw them live. One of the main goals of this is to actually understand how the birds are put together and also how they move and act. When you understand them as thoroughly as the great artists you can probably draw them from memory, without a subject in front of you. But another part, that I haven't mentioned as much, is empathy with what is seen. I was reminded of this when I looked at the pigeon in the lower right of this drawing. He his tilting his head in a certain way. This is a characteristic of this particular pigeon, and though all pigeons might move in a similar manner, they each are different. 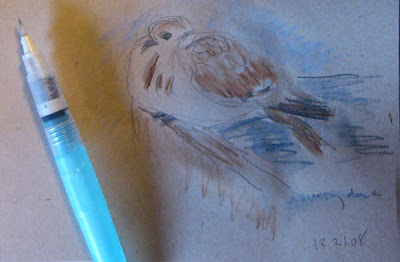 I had some empathy with this pigeon as I drew him. 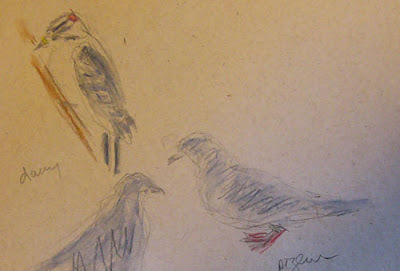 So drawing from nature can help you to understand the general structure of birds or other animals. 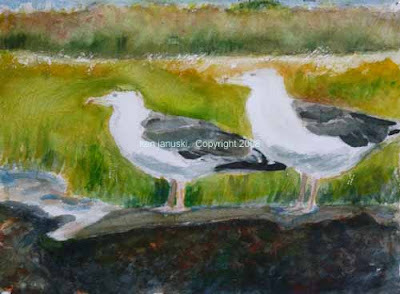 But it can also help you to see the individuality of each bird, animal, person that you draw. In many ways this is more important and rewarding than understanding them generally. You can't really draw a good likeness of a bird without some understanding of the general structure of birds and yet I think the best art shows the individuality of whatever is portrayed, be it a house finch or a person. I'm sure that just as some more scientific types would say it's wrong to anthropomorphize birds some artists would say it's not good to show the individuality of birds. It makes them seem cute, like drawings of babies with big, innocent eyes. But sometimes that is just what is there: the pigeon almost looks human in the way he looks out, as does the House Finch in the lower left. I'm sure some would say that is a bit of a crime. To me it's just being honest to what I see. Sentimentality is a great risk in science and in art. But absolute denial of some animal kinship with the world around us is probably far worse a crime. I know. I know. I said I would not publish any work until it showed a little more improvement. This sketch may not qualify. But I've been having fun with it. Last week I changed from pen and ink to pencil. I love pen and ink but it's mighty unforgiving, especially when drawing from life. Pencil allows far more deftness of touch, far more variety of line weight. I also added watercolor and waterbrushes about a week ago. The waterbrushes are new to me and a real treat. Today I was able to add the third component: watercolor pencils. 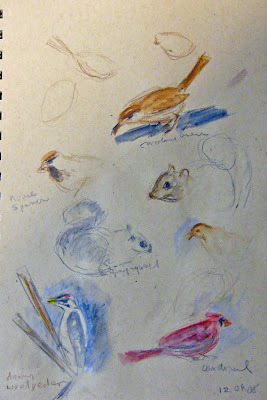 Watercolor pencils combined with waterbrushes is a great combination, just as Pam Johnson Brickell said in my earlier post about drawing birds from life. Pam, you are right. This is really enjoyable! You get the sensitivity of pencil and the instant paint quality of watercolor with just two drawing utenstils: a waterbrush and a few watercolor pencils. So now what had been a real struggle, requiring a great deal of no-pain-no-gain philosophizing, has become something enjoyable. People really learn best I think when they get some reward for their efforts and not just constant failure with the promise of some faroff gain. Drawing birds from life is difficult so it's important to get some reward as you go about it. There is the reward of knowing that you're understanding what birds look like much better than you used to. But it's important to get a visual reward as well. I think that will happen, both for me and others, with this great combination of tools. One side note: snow must be on the way. Our feeders were full of some of our more uncommon visitors such as a Ruby-Crowned Kinglet and Carolina Wren. That should make for more drawing opportunities tomorrow. And when you look forward to drawing birds from life as an "opportunity" you know that it's starting to be fun. Can you tell the difference? Yes, the Bay-breasted Warbler is a based on a photo. Though we DID get snow we also got a lot of wind and there have been very few birds at the feeder. So I finally gave up on drawing from life today and decided to try the new waterbrush and watercolor pencils on a sketch based on a photo. This Bay-breated warbler was very difficult to identify when we saw him at John Heinz Wildlife Refuge in Philadelphia in late May, 2008. Only the bay swatches and strongly defined black and white wings confirmed the identification. If nothing else this illustrates the use of visual clues to identify a bird when you don't get the best look. 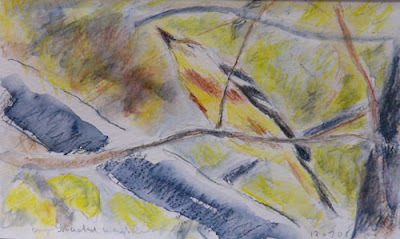 It also illustrates the difficulty of drawing warblers from life. The numerous Bay-breasted warblers that we saw this day were constantly moving. I had to choose between just indentifying them with my binoculars, trying to draw them in the brief time I could see them, or trying to get some photos(this was the only successful one) to use for later reference. All In all it's probably best just to look at them in binoculars and t try to seal the visual memory. When working from photos there's just too much missing information. So you may be able to draw a semblance of the subject but in the back of your mind you know that you're missing something essential. This really doesn't seem to deserve a new post. So I'm tacking it on to yesterdays.